I'm trying to hurry to finish my work so I can get downstairs and have some "me" time. I would work at this computer for 12-14 hours at a time if I did not set limits on myself and my co-workers were on auto-pilot. These are some books that I'm actually not giving away. I know, can you believe it? I bought these for myself recently and I'm excited to have some time to look through them as well as finish up a few UFO's. For time's sake I'm only going to give you a quick review of Jane Davila's Surface Design Essentials. I'll get to the other two as soon as I get into them a little more. No fair in reviewing a book you have not even had time to read right? If I've said it once, I've said it a hundred times, I'm a visual learner. But it is true. If I read instructions without pictures, and good pictures at that, then I stall and my mind goes blank. Here are a few snapshots of the photos and instructions in Surface Design Essentials. This is Toby's new book, St. Louis STARS. She was showing me her book and template set and we were talking at the QuiltWoman booth. 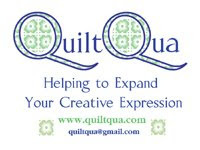 Toby is a Quilt Teacher, Pattern Maker, Award Winning Quilter so when you read her book and look at her instructions you can quickly see she knows how to explain each step so that students can understand how to repeat the process and be successful in making their quilts and other projects. EDIT : Apparently I have not been clear in my post. The template shown above is only one in her set of templates for her book: St. Louis Stars. The templates below are completely separate and do not relate to her book. They are some new and very useful templates she has designed. I hope that helps clear things up a bit. As soon as I get some more photos of the templates for her St. Louis Stars book, I'll add them above. Thanks!! So I decide to get them out to review them for the IHAN blog and I know you are going to laugh at me.....but some of you may relate to my insanity (if you don't - keep it to yourself because NO ONE likes a perfect person :) . I take them out of the package and head downstairs to photograph a demo. I get out the instructions and actually read them....all.....can you believe that? Then I get some scrap fabric out to use for the demo. I turn on the iron, get the fabric ironed and ready to go. I turn around to my cutting table and realize there is paper on the back of the templates. Dang, do I want to take off the paper just to do a demo and then the person who wins them won't get a brand new set? Then it dawns on me.....why on GGE (Gods Green Earth) would I even do this when Toby did a full demo of all the templates at Quilt Market and I took photos already. So, I decided to leave the paper on and show you what one lucky IHAN blog reader will receive. These templates work great for Square in a Square blocks, Flying Geese blocks, Star Sashing, and strips with triangles on the ends or unusual sash effects, Bowtie blocks, Snowball blocks as well as Bindings and Borders. You won't need to draw those lines on the back of your squares if you use the Cutting Corners Templates. Here is a glimpse of how easy the directions are to follow. If I can follow them.....trust me.....you can follow them. I'm a visual learner and between the easy to understand directions and the pictures it really is very simple. Toby has more samples on her blog, just click here. What I found to be very helpful with these templates are the flat edges that help to match the correct edge. There is no guess work with those little triangle tips. Although I'm good with math I don't like to have to "think" or "calculate" my way through a pattern. When I have to do that I tend to make silly mistakes. These templates help avoid the typical math calculations because you just use the strip sizes in the directions for your project and you use the correct template. If you are anything like me, you will need to put the other templates away because I am always picking up the an adjacent ruler or template and cutting something that not on the step I was on. I'm not a lame brain.....but I do have ADD and it does make it a challenge to break down things into small manageable steps that go quickly. Yes I did use my rotary cutter to cut some strips and begin to use the templates without tearing off the paper. They do work exactly as described.....and I guarantee you there will be many more uses for these templates once you begin expanding your ideas with other projects. The deadline for entering......let me see.....what is this week looking like?......Hmmmmm......how about I say only the first 30 comments count, you can only leave a comment once.....it must include the information requested above......and as soon as we hit 30....I close it and do the drawing? Good idea? I thought so too :) NOTE: I have to be able to contact you.....some of you don't know it but you are no-reply bloggers....I can't contact a no-reply blogger. So if you are not sure, leave an anonymous comment and be sure to put your name and e-mail address in the comment. It makes me sad to not count all the entries for a giveaway. Good luck to the first Thirty who read this post. PS....Thank you to everyone who continues to say I'm so generous. Generosity is a quality I possess.....but keep in mind, I have a store, http://www.ihavea-notion.com/ and you can't exactly walk in my door and get a demo....so I can share in photos those demos and then I get the pleasure of giving away the gifts that the extremely generous and talented folks give me to tell you all about. If I kept them all......it would be a crime and I'd have more than one person can possibly use.....so be sure to thank the folks who provide the lovely gifts too. I'll be back later to finish the other post....hope you had fun looking at these lovely items....see you soon. Lady Eleanor is sporting an apron inspired by her new book, Quilt Blocks on American Barns. You have to know if Lady Eleanor is talking there will be smiles, laughter and everyone will have a great time!! quilter for Lavender Fields. The correct spelling is Amie Potter. Thanks to who ever sent the comment!! Diana Edgemon made this quilt in warm natural tones from the Kansas Troubles Fabric line. Lady Eleanor continues to talk while a crazed Farmer rifles through her belongings. What fun would a Schoolhouse on Barn Quilt Blocks be without the entire cast right? I like the energy of the colors unfortunately I did not get the name of the person who made this quilt. It can be difficult to take photos with one hand and write with the other! You know I resonate with this quilt, "The Funny Farm" made by Sue Peters. I think this might just explain some of the following photos too. Eleanor continues to talk and says something about when Pigs Fly and then came a Flying Pig right up the isle....what a hoot. Then came a crazy man being chased by an attendant from the local "home of the mentally otherly abled." I have no idea how this fella managed to escape while still wearing a straight jacket. Yes, that is a straight jacket for those of you who have never seen one...LOL. I think they need to use more restraints next time....perhaps his shoe laces should be tied together so he could not run so fast. After Schoolhouse I was walking down the hall and the Quilt In A Day Clan were gathered chatting. I asked for a photo and they all smiled. What a fun loving group. Then they insisted I get into the photo.....I was reluctant to stand with such a clan....but I thought I would do them a favor :) Snickers. On the Market Floor I stopped by the Quilt In A Day booth several times but Lady Eleanor and Prince Orion were always working. I decided I would just go ahead and shoot some pix. Twice As Nice Plus More is the pattern you are looking at on the back wall. It includes instructions for 3 quilts. I just love the scalloped edges on the border below. They used the Scallops, Vines, & Waves Template by Quilt In A Day. My mood feels lighter just looking at this quilt again. Orion and Eleanor were kind enough to give me this incredible gift pictured below. You can imagine my surprise and gratitude. It includes an Autographed copy of Quilt Blocks on American Barns, a very fun tote bag and project bag, a pin with a photo of Eleanor, a package of "On Eleanor's Farm" pre-printed fusible web that includes 6 Chickens and 6 Roosters, and a package of "Quilt Blocks on American Barns" fusible web, non-woven fusible interfacing and templates that includes Windmills, Chickens and Roosters, Gambrel Barn Silos, Gothic Barn Roofs, "American Barns" text and half rectangle template. Quilt Blocks on American Barns has excellent photos and instructions for completing each project. There are stories of some of the barns Eleanor visited and lots of great pictures too. Leave a comment on this post telling me why you want to win this great collection and you have to promise you will make a Barn Quilt or wall hanging. Non-reply bloggers and anonymous posts will not be counted unless your e-mail address is included in the comment. The drawing will be done by random number generator on the 4th of July. 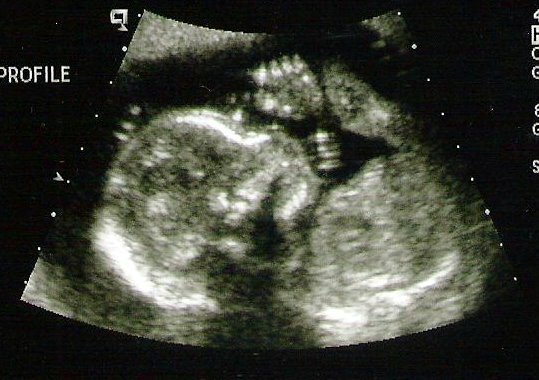 The IHAN blog has the exclusive ultrasound photos of Princess Kylee Marie who will join a Royal Quilting Family on or near November 9, 2010. Notice the hands in front of the face? Interesting isn't it? Do you think that says anything about what family she may belong to? Looks to me like she is going to have great hand eye coordination....which is extremely important for quilting, don't you think? This Princess will be absolutely beautiful, intelligent, outgoing, cheerful, hardworking, compassionate, caring, and very creative. Can you guess what family she belongs to? Recognize this fella? Prince Orion Burns.....well.....he is the Proud Father of the beautiful Princess Kylee Marie Burns who is expected to make her arrival sometime in early November. While hiding in the bushes at the Quilt In A Day Royal Headquarters I did happen to hear there are some incredible preparations going on for the newest Princess' Royal Quarters. When I get wind of the projects.....I'll be sure to share. You know me....I can't keep my mouth shut/ typing fingers still. Lady Eleanor with a photo of her adorable Grand Children. The Royal Grand Children at Play with Lady Eleanor. 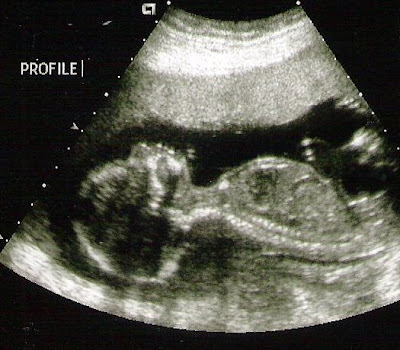 I'll bet you 10 bucks that Lady Eleanor has a photo of the Kylee's Ultrasound and she carries it with her.....I bet I win lots and lots and lots of 10 dollar bills!!! My Bot is finally back home where it belongs. It has a Bios problem....a problem with this particular model....and now it is up and running again. I felt like someone had removed my heart and my mind when my computer was visiting with the Geek Squad. As you can imagine I have so much work to do to catch up on my posts I don't even know where to start. So I'll be working on those posts the next few days. I have been extremely stressed lately with a number of things that are beyond my control, including the USPS. Did you know that if you use Click and Ship and take your packages to the Post Office they don't scan them so there is no "proof" that they have possession of your package? I have had 4 people not receive their EQ Software. All shipped on the same day from the same Post Office and all with Delivery Confirmation. When the mail carrier delivers your package with delivery confirmation they scan it as they leave it at your address or box. Prior to that there is no record of the shipment!!! I had no idea whatsoever that they did not scan it into their system upon receipt of the package. Essentially I am out quite a bit of money and postage too. If I were to purchase insurance on each package then I would have been able to file a claim. Interesting isn't it? If you thought this is the cherry topper....wait there was more!!! Another customer sent a check for 150.00 and a Thank You note. The money was not payment for an order.....it was a contribution for the Amani Ya Juu Foundation. Incredible isn't it? I get a Thank You card for her generosity.....dang I'm waiting for Oprah to knock at the door next.....I can hardly believe such wonderfulment coming my way today!!! Speaking of the Amani Ya Juu Foundation, we raised over the 2800.00 necessary for the Mid-Arm to be purchased and taken tomorrow to Africa. I asked Rosemary to send me a photo of the Mid-Arm so I could post about it on my blog. As soon as she gets me the pix I'll be sure to write a post. I am so incredibly glad that I found the wherewithal to put together that post when I was so exhausted and really did not want one more thing on my plate. Just that one more thing has made a huge difference because of all of you who contributed. Thank you all for trusting me, I'm so honored.